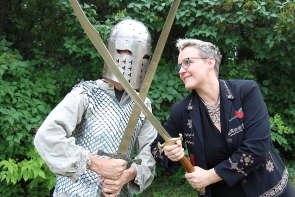 The Windy Castle Medieval Faire returns for one day, July 28. But just because it has been pared down from its two day debut last year to one day, it doesn’t mean there is any less family fun planned at the Coyote Flats Pioneer park near Picture Butte. “ We had 1,000 people through on the Saturday last year, if we’d had that many people on the Sunday, we would have been able to pay everybody like we promised,” said organizer Juanita DeVos, noting it was important to be frugal this year and ensure all of the outstanding debts from last year were taken care of this year without going into further debt. “A lot of organizations are trimming back or not doing events this year,” DeVos observed, noting they held several fundraisers in the past year to help pay down some of it. “ But we got such great feedback from people who wanted to see it again. 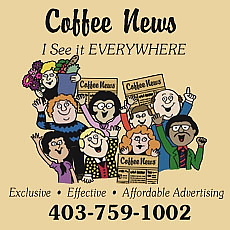 and we got a lot of support from the community of Picture Butte, ” she said, adding she would live to see the Windy Castle medieval Faire to not only become an annual event, but a popular tourism destination. There won’t be jousting this year, but there will still be plenty of fun including costumed characters, three different bouncy castles for all ages, a mead gardens, arrow tag and a round robin tournament of medieval bouts by members of the Lethbridge Medieval Club fighting with swords, axes and hammers, performances by Gymfinity Cirque and aerial arts. “Arrow tag is a lot of fun. it’s playing tag with arrows, which of course are safe,” she said. Lothar (Malmberg) the magician and Callum (Lykan) the Storyteller return this year. “The unicorn couldn’t be here this year, but we have his cousin the Unipony there for photo ops,” she said. 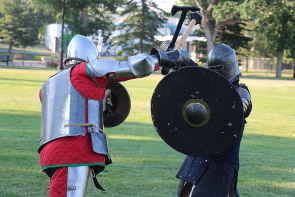 “Storytellers and magicians were the television stars of that era,” DeVos enthused, adding the medieval feast this year will be more medieval as suggested by last year’s patrons and with the help of Picture Butte restaurant Cactus Pub and Grill responding to requests for a more authentically Medieval feast. “It will be utensils optional. There will be smoked turkey breast and more,” DeVos enthused, adding the $75 feast tickets are apart from the general admission to the Faire. It includes an acrobatic demonstration from Gymfinity aerials and the finals of the martial battles. And this year there will be a small hay bale maze. “ That was the inspiration for the whole thing last year but we ended up not being able to do it because we couldn’t move the bales without destroying them. This year we made arrangement with Vandenberg Farms for enough bales for a small maze and there will be a silent auction for the bales afterwards,” she said. And if you don’t have a transportation to the Faire, the “magic bus” is back. “The magic bus will be doing a circuit of the Chinook Library on the west side, the downtown library and the Picture Butte library. We actually have a bus this year,” she said. Admission is $20 for adults, $10 for youth and 10 and under get in for free. Tickets for the Feast are $75 and include the finals of the battle royale, the meal and a special performance from Gymfinity. DJ Brent Cutforth will be dressed as a town crier for the night. 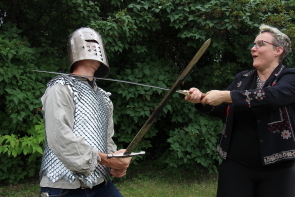 DeVos encouraged all patrons to wear medieval costumes for the event. The Faire runs from 9 a.m.. to 5 p.m. at Coyote Flats pioneer Park, Saturday , July 28. The Feast is 6-10 p.m.